Thank you Ellie Walsh Miethe for helping us continue your mission! The Susi Allten Cancer Survivorship Fund started it all!! 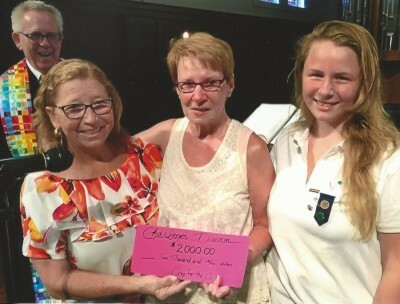 It was the impetus of the Seabreeze UCC Cancer Hope and Healing Program, which then begat "Charlene's Dream". Thank you SWING DIVAS for your kindness, generosity and continued support!!! You truly honor your friend Cindy Lee Bates. You make a true difference in the lives of women with cancer. for your kindness and truly missional ways. We could not have done any of this without you!!! Thank you Daytona College for cleaning and styling our wigs and making our women feel beautiful again!!!! Thank you Graphic Solutions for providing us with amazing print items and our fabulous "traveling" banner!! You are helping us to spread the word and we are SO grateful!!! "CROP FOR A CAUSE"!!! We are so grateful for your gifts!! Many thanks to Girl Scout Troop #825 of Ormond Beach for sharing your talents and stuffing the pillows for our cancer survivors!! ​ Thank you Sandy B. and Paul for your continued expertise and support!!! To our heroes at MESTRONG: we are honored to breathe the same air as you!!! Thank you for your support, your guidance and your friendship!! Thank you for your work on behalf of cancer survivors everyday.